Chances are you never got your hands on a limited edition 20th Anniversary PlayStation 4. Well, not unless you were very quick, very lucky or were one of the crazies who spent upwards of $20,000 buying one on eBay. You can though still bag yourself a piece of the retro-gaming aesthetic as Sony has released the limited edition DualShock 4 controller onto the our UK shores with a funky GIF showing the original rumbler. 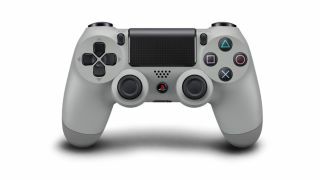 The grey PlayStation 1-themed controller, with the colourful original logo on the home button, is available from either GAME or Amazon for the princely sum of £50. Fingers crossed it won't be in the same bracket of limited editions as the 20th Anniversary PS4 console was though. That shipped a global total of just 12,300 units, matching up with the December 3 date of the original PlayStation's release...well in the US date format of 12/3 anyways. And don't for a second think this is just for the PlayStation crew though - the DualShock 4, with its Bluetooth compatibility, is actually a quite outstanding PC controller too. If you don't get on with the asymmetrical Microsoft Xbox controller layout, the DS4 is the best PC gaming alternative. Which console is best, PS4 or Xbox One?